What is Part D and how does it work? Part D is simply insurance for your medication needs. You pay a monthly premium to an insurance carrier for your Part D plan. In return, you use the insurance carrier’s network of pharmacies to purchase your prescription medications. Instead of paying full price, you will pay a copay or percentage of the drug’s cost. The insurance company will pay the rest. Your costs for Medicare Part D vary depending on the specific drug plan that you choose. In general, you are responsible for paying a monthly plan premium. You also pay for deductibles and copays (or coinsurance) for your medications. People with higher incomes may have to pay more for their plan. In 2017, there are many Medicare Part D plans to choose from in each state. Plans range from $15 – $170+. Choosing your drug plan should never be based on just the plan’s monthly premium. Why? Because every plan has its own separate premium, drug formulary, and copay. If you just enroll in the cheapest plan without checking the plan’s formulary, you may later learn that the plan does not cover one of your medications. Stand-alone Medicare prescription drug plans can be purchased for a monthly premium. You use this plan alongside your original Medicare coverage. People who buy Medicare supplements will often buy a stand-alone Part D drug plan to cover their pharmacy costs. Some Medicare Advantage plans also include built-in Part D drug coverage. It’s important to check exactly which medications a Medicare Advantage plan includes before enrolling. You want to be sure that your plan covers the medications you need. When do I enroll in Part D? Joining a Medicare Part D drug plan can only be done during certain windows of time. 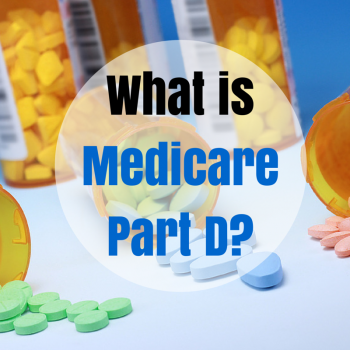 You are eligible to enroll in Part D when you first get Medicare. This window lasts seven months. It includes the three months before you turn 65, your birth month, and the three months following. A similar window exists for people who first become eligible for Medicare due to disability. Medicare Part D also has an annual election period which runs from October 15 – December 7. During this time, you can enroll or disenroll from any drug plan. This is because each Part D plan’s benefits, formulary, pharmacy network, provider network, premiums and/or co-payments/co-insurance may change on January 1 of the following year. The insurance company will mail you an annual notice of change so that you can review what is changing for the following year. Many people change their drug plan during the annual election period if their prescription needs have changed and another plan better suits them. In addition, you may be eligible for a special enrollment period under certain circumstances, such as moving out of the drug plan’s service area or losing your group medical coverage mid-year.